St. Patrick got bumped by St. Joseph, but both saints find their feast days shifted this year due to a quirk of the calendar. Their feast days fall during Holy Week and must be moved because nothing takes precedence over Holy Week, said Monsignor Robert J. Jaskot, chancellor of the Archdiocese of Baltimore. Since the feast of St. Joseph is the higher feast, it will move to Saturday, March 15. 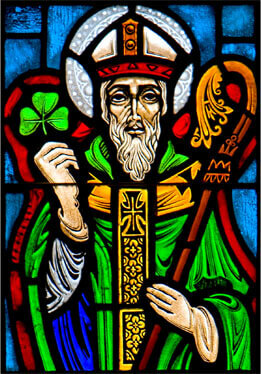 St. Patrick’s feast day, usually March 17, will be celebrated Friday, March 14. On St. Patrick’s Day, the Cumberland parish traditionally has Mass, to which they invite ecumenical clergy. It is followed by a corned beef and cabbage lunch. “We usually have a couple hundred people,” Monsignor Bevan said, adding this year they simply moved the date. The parish and the Irish shared history early on. Originally, it was founded as St. Mary’s, an English parish, in a log cabin in 1790. The parish received the first religious deed from then 5-year-old Allegany County in 1792. Irish immigrants were building the canal and the railroads, and the German immigrants set up shops to serve the growing city. The Irish outnumbered the Germans, and in 1848 they told them to hold Mass in the basement of the parish, pointing out the Germans didn’t even speak the language. The Germans complained to German-speaking Bishop John Neumann, who came to Cumberland to sort out the mess. He bought the land on the hill just a few blocks away that today is Ss. Peter and Paul, Cumberland. The Germans set up their own parish, and the Irish tore down the log cabin church and built St. Patrick. As Monsignor Bevan delights in pointing out, God prevailed because families from both churches eventually intermarried, mingling the Irish and German. Today both parishes have close to 1,000 families, and many can trace their roots back eight and nine generations. The real St. Patrick was born in Roman Britain between 385 and 415. At 16, he was captured by Irish raiders and forced into slavery in Ireland, where he underwent a spiritual conversion. St. Patrick spent the next 29 years in Ireland, converting virtually everyone. He ordained many priests and established dioceses and monasteries. Legend has it that he drove the snakes from Ireland. St. Patrick is the patron saint of the Irish, and is beloved by those of Irish heritage, who have a long tradition of celebrating with rivers dyed green, green beer, parades and dinners featuring corned beef and cabbage.